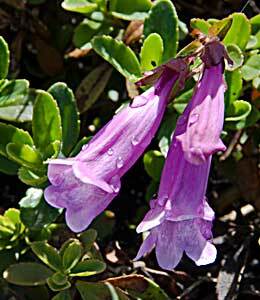 An evergreen groundcover to 5″ tall forming dense mats via creeping/rooting stems. Small 1/4 – 1/2″ leathery deep green leaves. Flowers are purple to lavender with a hairy throat. 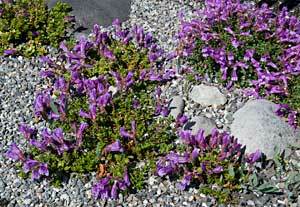 Found on rocky ledges, granite or lava soils. Native mostly to the Cascades of Wa. and Oregon. Also found on the Olympic Peninsula.